The Flash is back this week with a twist; in “Goldfaced,” Barry and Ralph team up and go underground to infiltrate the Central City weapons black market with the goal of retrieving a device they hope to use against Cicada. Naturally, this undercover operation goes awry in a flash as an indirect result of Barry not being able to ignore a cache of murderous cop-killing weapons on display (if I wore blue, I’d be freaked out by those too!) and then being forced to feign a criminal mastermind persona – which, to be fair, is quite convincing and entertaining for the brief moment he wears that hat. Following Barry’s Oscar-worthy performance, he and Ralph are roped into aiding the black market boss, Goldface, in raiding a lab full of vital, life-saving organs bound for the local hospital to save the lives of sick little boys and girls. At the same time, Iris takes it upon herself to do a little bit of investigative reporting and sneaks into Orlin’s home in an attempt to learn more about the man behind Cicada’s mask (and gosh, I wish he still was). Nora, under advisement from Eobard Thawne, moves to distract Sherloque Wells away from his investigation of her extracurricular activities by trying to set him up with a lady friend in an awkwardly comedic scenario inside Jitters. The spotlight of “Goldfaced” shines on the duo of Barry and Ralph. Running into problems from jump street, they have meta-power-inhibiting bracelets slapped onto their wrists, which immediately ups the danger level of their infiltration mission. As if that wasn’t enough, the jewelry doubles as a mini-explosive if Goldface deems them problematic. Not a great start to the escapade, but it forces the two off track and to think outside the box. Most interestingly, however, is the new understanding of the speedy team leader that Ralph gains. At one point, before they are to join the rest of Goldface’s henchmen in the raid, Ralph locks Barry inside the armored van and tells him that the Flash shouldn’t have to get his hands dirty and play a part in such a heinous act of villainy, but that he, who has long-sullied his own reputation and skirted the lines of the law, can. I was really impressed with Ralph in “Goldfaced,” and in that moment most especially; however, I feel as though Barry’s reaction underappreciated the lengths to which his friend was willing to go in order to protect him. Thankfully, the two are able to use some laser tag skills in a very generic, but nevertheless entertaining, action sequence in which they use a pair of blasters set to stun mode to take out Goldface’s forces before tag-teaming the aforementioned gangster. It turns out that Goldface himself is also a metahuman, and his powers make him largely impervious to damage. This square-off teaches the two power-locked Team Flash members an extremely important lesson: they can, in fact, defeat other metas without their powers (as tends to be the situation when Cicada and his lightning bolt dagger are involved) by making use of some ingenuity and quick thinking. It should prove interesting to see how this affects their strategy against the meta serial killer moving forward. Iris’ arc in “Goldfaced” puts the intrepid reporter in more danger than she’s been in since Season 3 (we try to forget that season’s existence, I know, but it’s hard), when she comes face-to-face with the meta killer, Cicada after sneaking into his home. 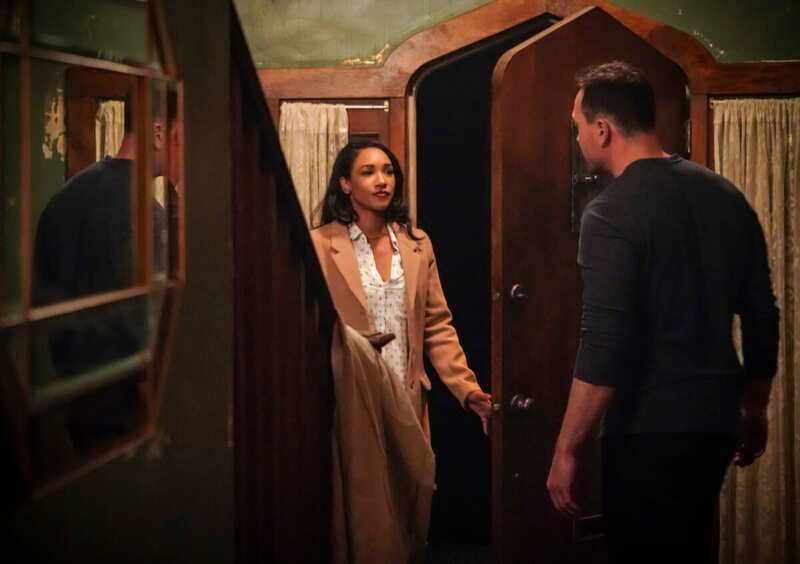 Iris manages to convince Orlin that his door was halfway open already and she was there to interview him regarding… an overabundance of iron in the local water supply (what steely composure you have, Mrs. West-Allen). Iris knows how precarious her situation is, and you can hear it in her voice. Speaking of voices, Cicada’s is not improving. Someone directing on the floor, please tell Chris Klein to stop that – to heck with continuity. Once Cicada uncovers her real reason for being at his house, Iris also manages to learn the villain’s weakness upon stabbing him with a kitchen knife in the spot on his chest where he was injured by DeVoe’s satellite, before assuring Orlin that they will stop him. It was actually refreshing to see Iris get a good lick in on Cicada, as he’s been tormenting her team for some time now. Iris’ role in this season continues to be solid. There’s no nonsense happening, just relationship building and strengthening, with a sprinkle of touching on her push towards creating and growing the Central City Citizen. This has helped to center her character in a relatable and likable manner, which is key. Nora’s antics, in her attempt to divert Sherloque from his singular focus of determining what exactly the young speedster has been keeping from everyone, center around tugging at the detective’s heartstrings. The twist here is that when the great detective runs into a woman at Jitters, she turns out to be Earth-One’s doppelganger of all of his ex-wives. Yes, you read that right; Sherloque fell in love with the same woman on seven different earths. That is at once crazy and endearing. The manner in which he runs into her is orchestrated by Nora, as she uses her super speed to unnoticeably alter the placement of objects in the coffee shop, causing the woman to slip and fall into Sherloque’s arms. What follows is an immensely awkward exchange that sends the poor woman fleeing under the impression that Sherloque had been stalking her. While this is rectified by the end of the airtime, it is cringy, but in a good way – or at least an entertaining one. “Goldfaced” closes with Sherloque realizing that the apple of his eye might be a metahuman on this earth, which puts her in immediate danger of being on Cicada’s hit list – adding yet another layer to the plot of this season. If only Cicada himself could manage to be interesting. The Flash - Season 5 Episode 13 "Goldfaced"
Barry and Ralph are entertaining as a duo in "Goldfaced," especially given Cisco's current MIA status due to his metahuman cure project. More layers were stacked into this season's plot, but its resolution is still in question.